encouraging women in the Middle East and around the world to speak up, to Dulce Candy sharing her own story as an undocumented immigrant and military veteran, creators from around the world have used our platform to express themselves, encourage new perspectives, and inspire solidarity within global fan bases. We want to continue empowering people to come to YouTube to tell stories and form connections that encourage empathy and understanding between diverse communities. 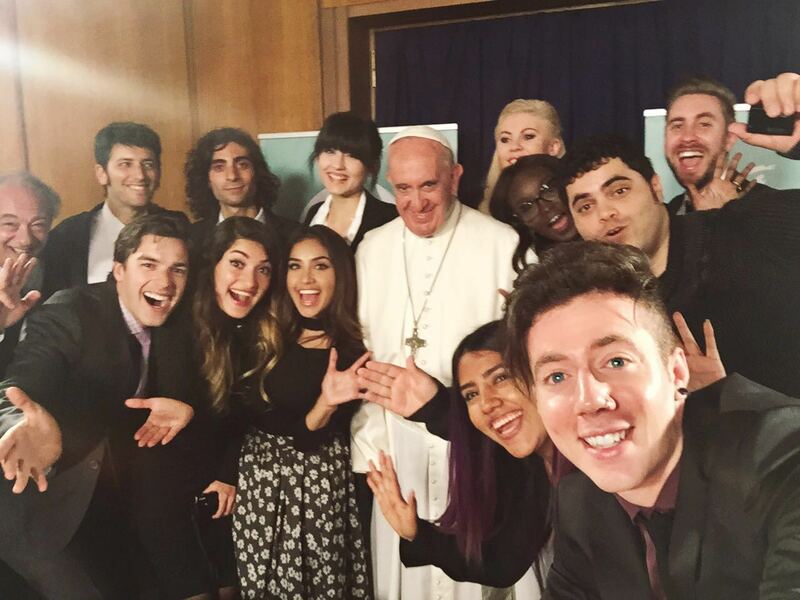 That’s why today 11 international YouTube creators met with Pope Francis, who cares deeply about bringing young people together. This first-of-its-kind dialogue took place during the VI Scholas World Congress, which the Pope created to encourage peace through real encounters with youth from different backgrounds. The YouTube creators who participated in this conversation represent more than 27 million subscribers globally. They come from ten different countries and diverse religious backgrounds: Louise Pentland (United Kingdom), Lucas Castel (Argentina), Matemática Río (Brazil), Hayla Ghazal (United Arab Emirates), Dulce Candy (United States), Matthew Patrick (United States), Jamie and Nikki (Australia and South Sudan/Egypt), Greta Menchi (Italy), Los Polinesios (Mexico) and anna RF (Israel). During the conversation with the Pope, these creators raised topics that they are passionate about as role models, including immigrant rights, gender equality, loneliness and self-esteem, and greater respect for diversity of all kinds. We’re inspired by the many conversations these creators have sparked throughout their YouTube journeys. To hear more about what they discussed at the Vatican today, tune in to each of their channels for personal videos in the coming weeks. We hope to continue helping people share their stories - the more we can all understand, the more we can come together as a global community. YouTube has helped millions of people see that we have a lot in common, despite our differences. Building these bridges can start with a simple conversation, and over the past 11 years, we’ve seen YouTube creators use the power of video to do just that. From Hayla Ghazal encouraging women in the Middle East and around the world to speak up, to Dulce Candy sharing her own story as an undocumented immigrant and military veteran, creators from around the world have used our platform to express themselves, encourage new perspectives, and inspire solidarity within global fan bases.